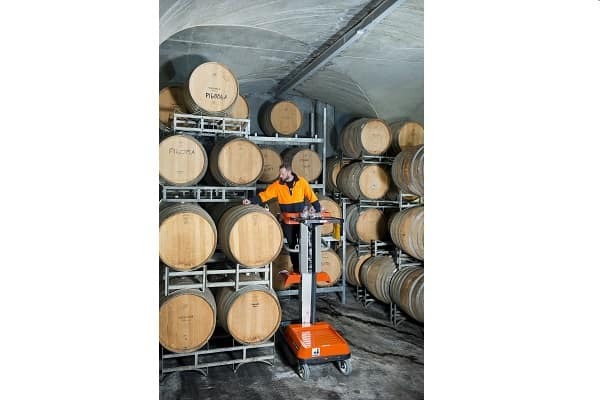 A Bravi Sprint elevated work platform (EWP), which is distributed in Australia by Toyota Material Handling Australia (TMHA), has been used at a Victorian winery to make savings in production time. Yering Station Winery in the Yarra Valley commissioned a Bravi Sprint EWP in May and says safety features, including a cut-out in the hydraulic lifting system if the interlocking gate is not closed correctly and an operator platform service lock, have helped the company make improvements in safety. The Bravi Sprint provides a fast and agile EWP solution in warehouses, shop floors, commercial maintenance and in building management operations, such as window cleaning, ceiling repairs and electrical repairs and maintenance. TMHA last year began distributing four models of fully driveable Bravi EWP, with working heights up to 5.3m and platform capacity up to 280kg.